I’ve been listening to David Chastain’s music since his ‘87 solo album, Instrumental Variations. By 1987, David was already well into his recording career, having released albums with Spike, CJSS (as David Chastain—solo albums—and as Chastain). Albums released by his band Chastain were more of a band effort and up until the early 90s, featured female vocalist Leather Leone (It was so good to see Leather get work after her stint on the show Happy Days). After Leather’s departure from the band, she was replaced by Kate French. While I’ve never been particularly into either singer, Kate is the more tolerable of the two. 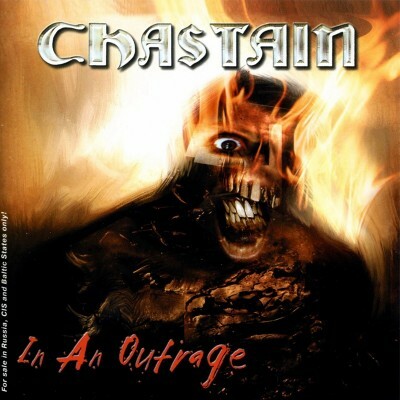 In an Outrage is the latest from Chastain. Musically, David seems to dumb down his playing on his albums with vocals. In an Outrage is solid musically; it just sounds like the writing lacks the extra creative spark that is assured from every instrumental offering from David Chastain. Kate’s lyrical writing is hit-and-miss, too. At times, her lyrics are derivative of every bad power-metal lyric of the last 20 years. At other times, her lyrics are just plain hokey: “You think you know me. Well, you don’t know me at all, let me tell you. Why do you treat me like I’m dumb when I’m the one who makes you come over and fill me up?” What in the hell is that? David and Kate are joined by former Vicious Rumors rhythm section Dave Starr (bass) and Larry Howe (drums). I will give this album one thing—it’s got perfect guitar tone.